Bell & Bullock can lead sessions in all aspects of their work in a fun, safe and friendly environment. We have extensive experience with children, youth and adult groups in many different community and educational settings. This includes working with groups with special needs and learning difficulties. Workshops are suitable for both one off sessions and long term residencies. We can tailor workshops to meet your brief or individual requirements. Take a look at the workshops on offer below, and if there’s anything you’d like that you don’t see, get in touch and we’ll do all we can to accommodate you. The university of Sunderland have been working with Bell & Bullock for the past three years, and it is certainly a relationship we are keen to nurture. The amount of passion, enthusiasm, skill and expertise they bring to every workshop delivered; engages and stimulates students and lecturers alike. Their contribution to the programme is massively important for student development and progression. Not only do they help with confidence, but allow the students to develop very intricate circus skills. The students absolutely love the workshops and we look forward to doing more work with Bell & Bullock in the future. Bell and Bullock Circus are an excellent outfit! Our pupils thoroughly enjoyed learning new skills, practising daring acts and, quite literally, clowning around! Karen and Dafe are fabulous with the children and have the skills and expertise to teach the fine art of the circus to any age. They know exactly how to instil the discipline of concentration and determination needed to learn new skills, while ensuring their sessions remain relaxed, fun and full of energy! I would happily recommend their circus workshops to any school hoping to bring out the best in their pupils! I would fully recommend this company for working with Drama/Dance/Performing Arts students and would certainly use them again. Although our students were initially a little reticent about involving themselves completely, these skilled practitioners pitched the activities at exactly the right level so that eventually all were actively involved and participating with enthusiasm and enjoyment. The skills and techniques covered were ideal for this early stage of their course and they have utilised many of them in their subsequent performing arts projects. Teaching the Clowning Module on the new BTEC in Circus and Performing Arts running at Circus Central, Newcastle-Upon-Tyne. Clowning and Physical Theatre Residency for Seven Stars/Satellites Adult Learning Disabled Theatre Group at Headway Arts, Blyth. Circus and Physical Theatre Workshops for Sunderland University Drama Students as part of their Popular Performance Module. Show in a Bag Street Act Creation Residency in collaboration with Lets Circus and Circonnection ( a professional development programme run by circus professionals for circus professionals throughout Europe). 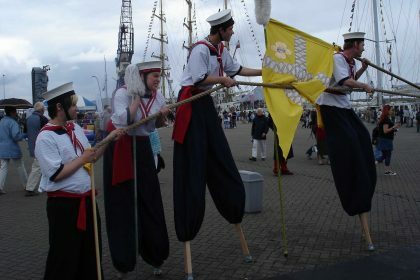 Training Performing Arts students in collaboration with Lets Circus to perform at the Hartlepool Tall Ships event. Karen has a BA (Hons) Degree in Creative Arts – Drama from Newcastle Polytechnic (now the University of Northumbria) and has trained on the School for Fools and Physical Theatre courses at Circomedia in Bristol. Dafe attended Fool Time in Bristol and has a background in marine engineering, prop construction and circus skills. They regularly attend courses in Clowning and Physical Theatre with leading practitioners to enhance their own skills. Our workshops aim to be enormous fun, whilst promoting many other benefits. Physical skills such as balance, hand/eye coordination, concentration, strength, stamina, gross and fine motor skills, spatial awareness, fitness and flexibility are improved. They also encourage self-confidence, teamwork and co-operation. Children (and adults) are invariably amazed at what they can achieve in just one session. 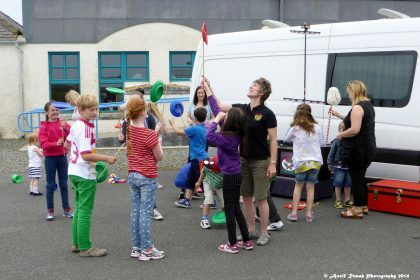 Circus Skills and Coordination Skills fit in with the National Curriculum! The red nose acts as the smallest mask in the world from which we can let our delight and playfulness shine through. 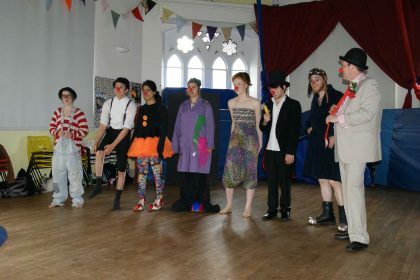 We lead games and exercises that help participants to discover and unleash their inner clown. Slapstick fights, trips, falls and traditional gags and routines can also be introduced to help develop physical comedy and character skills. Recommended for older pupils, students and adults, but can be adapted for younger children. In these workshops we explore techniques for creating street and outdoor theatre. Recommended for older pupils, students and adults. These workshops look at creating theatre through the moving body. They focus on narrative and character rather than text or scripts. Physical approaches and complicité are explored in order to arrive at a vocabulary for devising new material. 1) Balancing Objects and Centre of Gravity. 2) Juggling, Gravity and Air Resistance. 3) Diabolos, Gyroscopes and Turning Forces. 4) Toothbrush Twirling, Centripetal and Centrifugal Forces. 5) Tablecloth Trick, Inertia and Friction. It is always an absolute pleasure to work with Bell and Bullock (aka Karen and Dafe). As a dynamic partnership they offer a diverse range of characters, interactions and skills to suit a broad mix of audiences and events which works well for us across all of our activities and programmes. Both your show and workshops were thoroughly enjoyed by all who participated. 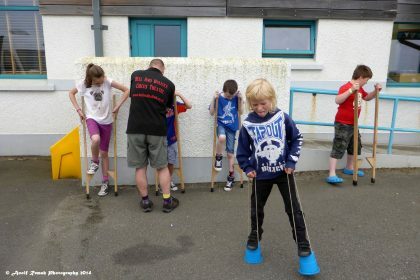 You’ve left behind a trail of budding young jugglers and stilt walkers keen to develop their skills and a very positive lasting impression of the high quality of your work. I just wanted to thank you so much for yesterday- you really made the day. Emma, the class teacher, said you were a big hit with the parents as well as the children. Thanks again, and looking forward to working together again in the autumn.